That word alone carries enormous significance for most Australians and today, being ANZAC Day, it is worth remembering and recording some of the things about it’s significance to me. But in order for it to make sense to some of the non-Australians who visit this blog I should probably explain what it is. More than any other Day, this one is becoming our true National Day. If like me, you grew up in the 60’s and 70’s in Victoria you will have grown up hearing the stories of Australian soldiers, their bravery and the battles they fought. I was born just 12 years after the end of World War 2 and every family in those days had some military tradition. Bill Joyce, my father’s father, was born in Tasmania on April Fool’s Day 1885, and in his words “has been a fool ever since”. At the age of 13 he ran away from home and worked his way by ship to New Zealand where he settled in Dunedin. 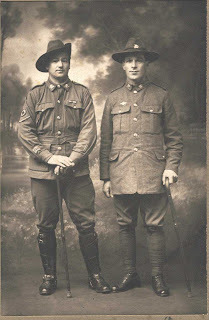 The photograph shows a young Bill Joyce [on the right] taken in 1917, and the story of how he came to be using that cane is below. In 1914 the world found itself at War and young men in Australia and New Zealand answered the call to arms and rushed to defend the empire. “…news that Australian and New Zealand contingents had been thrown into the fighting at the Dardanelles had an immediate influence upon recruiting.” Initially the casualty lists and the report of the landing had a marked effect with the Australian enlistments amounting to thousands per month, reaching a peak in July when 36,575 men enlisted Australia wide with 21,698 of those coming from Victoria. Religion: Presbyterian, Marital Status: Single, Occupation: Labourer, Address: 44 Bay View Road, South Dunedin Employer: Dunedin Drainage Board Description : Height 5 feet 6 inches Weight: 158 pounds Complexion: Dark Eyes: Grey Hair: Brown Next of Kin: Mother, Mrs Mary A. JOYCE 4 Grant St., Launceston, Tasmania. 30/11/1915 ‑ Disembarked in Suez, joined the Otago Mounted Rifles. At this time there was a flood of reinforcements arriving in Egypt, the campaign at Gallipoli was winding down with the decision to evacuate having been made and the reorganisation of the ANZAC Corps began. The first and Second Divisions “…were concentrating in the growing camp at Tel el Kebir, where the units, which at first had to sleep under their transport waggons or water proof sheets, were now housed in a spacious tented camp. In similar but rather greener surroundings, at car junction near Ismailia, the New Zealand and Australian Division was assembling”. (2) Machine-gun section will not be divided; it will remain with Headquarters Wing. (3) Companies will be fairly divided into two parts…”. About three quarters of the men in all battalions were reinforcements. The bonding of these new units into efficient highly trained forces was hampered by the formation of a number of specialist service units drawn from within the ranks of each battalion. They included the machine gunners, engineers and pioneer battalions. The latter were made up of men less expert than engineers but more highly skilled than the general infantry. “These, though organised as infantry, were not intended, except in emergencies, to live in the trenches, but usually came up for their daily, or nightly, task, returning to their camps or billet when it was ended”. 09/04/1916 ‑ Embarked for France from Port Said. The country around the french city of Armentieres had been regarded as a form of nursery for untried troops as the arrived from Britain. In an unofficial truce the germans refrained from shelling Armentieres whilst the British held off from shelling Lille. It was for this reason that this sector of the line was relatively quiet. By the time the ANZAC’s arrived the British had begun to move their forces south to Amiens in preparation for the great offensive. The advance parties in which Bill JOYCE found himself arrived in the area at the beginning of April in “motor-lorries or old London omnibuses, painted grey, windowless and dilapidated…After motoring fifteen miles through the normal flat green Flemish country side, along cobbled roads frequently fringed with red-tiled farms and smaller cottages, these parties reached Croix du Bac, a small village containing the headquarters of the [British] 34th Division. A mile farther on they passed over the River Lys, a brimming stream, wide enough to carry a fairly constant traffic of barges loaded with road metal and other supplies, and on its far side entered the straggling villages of Sailly, Bac St. Maur, and Erquinghem, built along the roads running parallel to the river and near its bank”. It was here that they saw the first signs of war with many of the cottages damaged by shells and many others fortified with sand bags. Closer to the lines all motor traffic was halted and the men had to make their way forward on foot along roads lined with hedges and elms, which gradually became more unkempt and showed greater signs of damage as they got closer to No Mans Land. The ANZAC command had to learn the British method of organisation and how they held the frontlines. In brief, the country was divided into parcels held by different battalions. Each brigade held about a mile and a half of the front line with about two to three miles of hinterland behind them. “Two reserve battalions would be billeted farther back, in farmhouses or cottages along the country roads. In the same neighbourhood would be the brigade headquarters, the machine-gun company, some of the divisional pioneers and engineers responsible for work in that region, and the field artillerymen whose batteries were grouped at that distance from the front”. At this time Bill JOYCE began to keep a diary. Written in pencil in a small note book 8cm by 12cm it covers the period from May 13, 1916 to September 14, 1916. On the 16 May he wrote “Spell all day, a few shells flying about”. By the 18th the work of the Pioneers had started in earnest and from then to the 3 June, Bill JOYCE’s time was spent building trenches. The Australians had entered the lines at Armentieres on 20th May, 1916. Two Divisions each with two brigades in the front line and one in reserve were side by side on the front lines with the New Zealand Division behind them in training. On 5 June 1916 he wrote “started day work repairing sap, just got going and BROOK was killed”. This is fairly typical of the entries in the Diary. Events are recorded sparsely with no complaint over conditions nor much mention of the danger the Pioneers faced. It was up to them to repair the trenches, to lay the barbed wire that stretched between the lines in No mans land. Much of this work was done under the cover of darkness and Bill started night work on 6 June, 1916. The nights were short “darkness lasting only from 9.30 to 2.15”. On 8 June he wrote “shelled out of bilet, some killed and wounded, a few mates and I went up town and arrived home pretty full”. 11/06/1916 ‑ day work blaster arr. 29/06/1916 ‑ roused out at 10.30 AM but only for a short while. Returned for dinner, drink of tea, dry bread. Leftenant COOPER killed with a shell Saturday. 01/07/1916 ‑ Saturday, then had to start making a dugout so never had any sleep 6 PM sleeping in the open beside road. The terrain of this part of France could hardly have been more different than that which the ANZAC’s had found on the Dardanelles. “The River Somme ambled towards Amiens, coiling in long, lazy loops through a marshy valley, joined by a score of minor tributaries that turned it, here and there, into a waterscape of struggling streams and islands. Just behind Corbie it met the Ancre, flowing down through Albert from the north-east, where the British Army stood astride the river, on the edge of the high chalk downs where the German Army was entrenched”. The men of the Pioneer Battalions worked day and night fortifying the British positions; building trenches, raising duck board walkways above the swampy grounds, and laying barbed wire between the lines, often at night and under fire from the German positions. By July of 1916 there was a stalemate and the British High Command needed a breakthrough. With the French hard pressed along much of the front, the Somme became the centre of the attack plans. On 1st July, 1916, as Bill JOYCE was trying to sleep beside a road the attack began. The plan was for the infantry to assault behind a creeping barrage by the artillery which had been pounding No Mans Land and the German lines incessantly for several days. For some unknown reason the barrage ceased ten minutes prior to the troops going over the top giving the Germans ample time to man the ramparts of their defences. As the Tommy’s climbed from their trenches to begin the assault the machine guns cut them like chaff before a scythe. On that one terrible day 56,000 allied troops died and three times that many were wounded. But that wasn’t the end of the First Battle of the Somme. 03/07/1916 ‑ Gloster Av filling sand bags, bombardment at night, Estamenit burnt not far from where we were sleeping then it came on raining we all shifted back to our old bilet and a…several of our boys wounded and some missing. Many of the trenches were named after British Counties, for example two of those near Bois Grenier were called York Avenue and Devon Avenue . “On the 3rd [July], General GODLEY having returned some days previously, the staff of II ANZAC moved to la-Motte-au-Bois and at midnight took over from I ANZAC the command of the Armentieres sector. Thus it came about by July 8th, although the 5th had not yet completely arrived, of the 338,005 troops in the Second Army, 100,000 were Australians and New Zealanders”. For Bill JOYCE things continued in much the same manner as they had for the previous couple of months. 06/07/1916 ‑ turned out 6.30 AM had breck then went to work berrying wire got the trench finished 11 AM and all went to the pub for a beer had 2 hours for dining, arrived home 3.30 then made some toast and after tea I went and dug some new potatoes for breakfast. 04/07/1916 ‑ We were in bed and a bombardment started the shells were flying all over the town set fire to five different places one not far from us and some of the boys were up on the building and some one saw them lite their pipe and said it a spie so out came Captain DANSEY and Major Perry COOCK [?]. DANSEY fired and the man jumped down and then Perry COOCK fired five rounds back at DANSEY so they are grate at catching spies. It was a great joke with all the boys. 07/07/1916 ‑ One of the cooks and I went for a walk after tea to have a look at some of the buildings where the shells smashed. it is a real shame to see the… and after that we went into some of the gardens and had a good feed of strawberries, red currants, black currants, cherries, raspberrys, then got a bag of spuds. There was a few shells landed near us so thought it time to go so we left, came home, had a cup of tea, then went to bed. 08/07/1916 ‑ Revaly 6.30 AM. Had some new spuds for breakfast then fell in 8 AM. Marched to work berring [burying] wire. It was very hot work so did not do much. Arrived home 3.30 PM had tea 4.30, then got paid and after pay went and visited some of the gardens had a good feed of strawberries and then went to bed. 10/07/1916 ‑ Monday, weather fine, 8 AM and six of us are still on picket. 11 AM the Germans are landing shells into the town not far from us then have set fire to a big church. It is now one big blaze still boring on with. Picket finished at 9.30 PM all well. 11/07/1916 ‑ Tuesday, Weather fine still carrying on with the picket just came back from stealing some spuds, we are going to have them fried for dinner. I met a good number of chaps I knew while on duty we got dismissed 10 PM, all well. 12/07/1916 ‑ Wednesday, 6.30 PM setting on the edge of a canal which runs past our bilet and two mates are fishing, but don’t think they will catch many. To finish up the day we got dismissed at 10 PM then my mate and I went and made a cup of tea and some toast and then retired at 10.30 PM till morning. 16/07/1916 ‑ Sunday, Revaly 6 AM, breakfast 7 AM, then went to work, we had about 2 miles to walk but when we got there was plenty of work but no one knew what to do so we all sat down and smoked until 1 PM then came home, worked for one hour pulling bricks around our bilet then at night a few of us went for a walk, had a few beers, spent a nice evening. 19/07/1916 ‑ Wednesday, got out of bed 12 AM had dinner a piece bread and jam, drink of tea then went and had a look from one of our poasts, could see our shells bursting in the German lines. It is now 3 PM and our grins are still going strong. At 7 PM there was a big bombardment, it lasted seven hours, my mate and I had to go out to unload the waggon so we could see the do place lit up it was a fine nite to see, we arrived home 10.30 PM. “11 -11.30 a.m. Registration by divisional artilleries and trench-mortars. 11.30 – 1 p.m. Registration and bombardment by 9.2-inch and 12-inch howitzers, and registration by 6-inch howitzers. 3-6 p.m. Wire-cutting by 18-pounders and medium trench mortars. Bombardment by 18-pounders, 4.5-inch howitzers, 6-inch howitzers, and (from 4 p.m. onwards) by 9.2-inch and 12-inch howitzers. The jubilation shown by the troops as they watched the barbed wire of No-mans Land blown apart and the fortifications of the German line pounded, soon dissipated as the German guns returned fire. As the Australians waited in the trenches for the shelling to stop they began to take casualties not only from the German guns but from a number of Allied shells which dropped short. At about 5.30 p.m. with the sun still high in clear skies, the assault began. As the Australians crossed the lines between trenches they were met by machine-gun and rifle fire. All across the line of assault officers and men alike fell. Although both the British and Australians managed to capture part of the German trenches the fierce thrusting and counter thrusting which carried on throughout the night eventually forced them to withdraw. On that one night of the Battle of Fromelles the 5th Division lost 5,533 men and the 61st Division 1,547 . 20/07/1916 ‑ Thursday, Revaly 6 AM, breakfast 6.30, there are still a good deal of…flying they have been going all day, it is now 4 PM and I am just going to have a good tea, some roast beef, coleyflour, potatoes and jam tart and plum pudding then got to load some timber, arrived home 2.30 AM feeling tired had breakfast then turned in till twelve. 22/07/1916 ‑ Saturday, got out of bed 12 AM had dinner which was a mug of tea and a piece of fat bacon, then we all went fore a bath to Frontenep [? ], and when we got back home I again went and gave the cook a hand with tea, also had a good feed, some jam tart. It is just 6 PM and everything is set again ready to go to work at 9.30 PM. The officers have got the grapphone going well. 23/07/1916 ‑ Sunday, Arrived home from work 3 AM had breck, turned in till 12 AM, got up had dinner, the cook gave me some puddin, it was real good, then I went and give the sargeants cook a hand to get the tea ready, so got another good tea. Are now waiting fore 9 PM to go to work again at 9.30 PM. 25/07/1916 ‑ Tuesday, Just out of bed 12 AM had dinner which contained tea and bread and jam. I have just had tea, a beef stake pie, mashed potatoes and pickles, so am feeling well and ready for a good nights work at 9.30 PM till 3 AM. Things were quiet. 26/07/1916 ‑ Wednesday, First out of bed 12 AM, had a little dinner, bread and jam, then we had to do 1/2 hour drill, then I went and picked some plums fore tea and they were good, so feeling fit fore work again. 27/07/1916 ‑ Thursday, Arrived home 3 AM, had breakfast, went to bed, got up at 12 AM had dinner, then we all went to Armentears to go through gaes [?]. We arrived home 5 PM had tea of bed 12 AM, alls well, just going to give the cook a hand with the tea, roast beef, coleflour, potatoes and carrots, rubarb pie. We all enjoyed tea so feel fit for work at 9.30 PM. 29/07/1916 ‑ Saturday, Just going fore a bath then when we come back we get paid, we are getting fifteen franks, 10/9, then had tea and goe to work at 9.30 PM, barring timber up Wellington Avenue. 02/08/1916 ‑ Wednesday, having holiday today, nine of us start night work at 9.30 PM. Night work cutout. Shifted from Rue Karie [Rue Marie] to trooplines, left 4.30 PM and arrived 6 PM where we were put into an old malt house, the floor is verry hard. 03/08/1916 ‑ Thursday, Weather fine and we have been fixing it up, all having a look around some of the old ruens, all so a good deal of shells have been landing about 300 yds from our home. 04/08/1916 ‑ Friday, filling sand bags all morning and after dinner I went to portinelp [?] to see Jolley and we had tea together then went for a walk. I arrived home 10.30 PM, all the boys were in bed so I soon turned in. 05/08/1916 ‑ Saturday, I have been helping the Sargents cook to fix things up and all the others were still fixing our house making it safe and 1.30 PM they went for a bath. I never went. 08/08/1916 ‑ Tuesday, Still carring on with the building bivies and at 3 PM over came a few shells. One small shell landed near the yard and just about cut one of the chaps arms off and blew three of his toes off but we all scattered about so they could no get any more of us. 09/08/1916 ‑ Wednesday, having holiday and going on gard at 6 PM fore 24 hours. 11/08/1916 ‑ Friday, went to work 1.30 AM building up the saps, a verry fogie [foggy?]. Arrived back home 10 AM had dinner, then had a sleep till tea time, then three of us went fore a walk to see if we could find any curios. 13/08/1916 ‑ Sunday, Went to work 5 AM, arrived home 11 AM then packed up, had dinner, marched out 1.30 PM with full pack up, marched up to the old bilet which is one mile from trooplines where we put our blankets on the wagen, then we all marched to the edge of the canal where we slept all night. We got up to 6.30 AM had some bisc and bully. 14/08/1916 ‑ Monday, At 8 AM we all lined up with full packs and were kept standing fore 1/2 hour then had to take them off and some of the men had to clean up all rubbish. We left Armentiers 1.30 PM and it just teamed , we all got drenched to the skin. We arrived at Steen Worck [?] 4 PM which was six miles and I wated till 6 PM for the train. We passed through Hazelrock [?] and arrived at Eblingham [Erquinghem?] 1/2 8, then walked three miles where we put in an old barn at 1/2 past ten. There is plenty of straw so we all slept well. 16/08/1916 ‑ Wednesday, Revaly 6 AM, half hour fisical drill, after breakfast 8 mile march with full pack up. Lecture 7 pm to 7.30 PM. 18/08/1916 ‑ Friday, Revaly 6 AM real blan, pack kits 8.30 marched out with full packs up went 3 miles then had a foot inspection. After dinner done the washing. 20/08/1916 ‑ shifted Sunday from Etaples, walked 9 miles to St Amer [Bac St Maur?] arrived 7.30 had tea, left by train at 10 AM, arrived Longpre 5 AM Monday 21/8, then we all marched past a can of tea where we got a drop of tea and a piece of cake, then we marched seven miles where we was all bileted in old barns. 22/08/1916 ‑ Tuesday, Lecture by leftenant cournel King after dinner started with G. SAnds in the bar mess, we are cooking in a privet house and there are two old french ladies there and they want to do all the work. 26/08/1916 ‑ Saturday, We packed up 27/8 shifted left hallenco [?] 1.30 AM walked to Longpre, then got on the train fore two hours then got off walked 7 [9?] miles to some [Somme] and it was raining, slept with a big tarpolin over us. 28/08/1916 ‑ Monday, today we all setting down waiting fore our bilets to be made and a few heavy shours. 29/08/1916 ‑ Tuesday, Started night work, we went about 3 miles in moter buses, then had four mules and there was mud up over our boot tops, we got home seven in the morning, only one got wounded in the left arm. 30/08/1916 ‑ Wednesday, today we all doing nothing but sleep and try and keep dry. 03/09/1916 ‑ Sunday, we all packed up and shifted about 1 1/2 miles back, started to put up camp but pulled it all down and shifted back again, just about 1/2 mile farther on than our old camp. The rest of the New Zealand Division was brought up to the Somme battlefield on this day. “The far-off growl of the bombardment had rolled nearer with every step the New Zealanders took on the march from Amiens. By the time they reached Lavieville, just a few kilometers from Morlancourt, they could feel the vibration beneath their feet. It was 8 September. In a bid to rock the line so painfully gained by the British and French, and to thwart the big attack they were clearly preparing, the Germans mounted a mammoth counter-attack. The line swayed, and held, but the shock-waves of the duelling guns, massed now in thousands on both sides of the line, rippled across the few miles that lay between them and the hutted camp at Lavieville as if to underline the uneasy fact that the N.Zedders were for it. It was not that they had never heard gun-fire, but they had never before heard it on such a scale”. 09/09/1916 ‑ Saturday, we had a rifle inspection and gas element inspection and the rest of the day off. One shell landed in our camp killed 2, wounded 11. 10/09/1916 ‑ Sunday, Left camp, 6 AM, arrived back 4 PM. 11/09/1916 ‑ Monday, shifted camp about 3 miles nearer the line. 13/09/1916 ‑ Wednesday, In the front line, a large number of ded germans, took a baynet of a german. 14/09/1916 ‑ Thursday, holiday till 4 AM, then all have to fall in with 220 rounds amin, pick, sh, oil sheet and iron rations. We have just been inspected to see if we have got all our equipment and expect to goe out some time tonight in the big battle there and about 30,000 wounded men hear today. The time is now 5.30 PM. Alls well. “As the New Zealanders struck across country to their assembly position in the wood, they could see gunners, working flat out. It was a chilly evening but, sweating with their labour, many had discarded tunics and shirts as well. They looked like demons, bare torsos glowing red as the shells left the muzzles and disappearing into the shadows as the guns recoiled. It seemed to the New Zealanders, half-deafened by the noise, half-suffocated by the fumes, half mesmerised by the sight, that they were passing through hell itself”. “…the New Zealand Medical service had already taken over the Advanced Dressing Stations, collecting posts, etc. and our troops were taking over a section of the line between Delville and High Woods, supported on eaach flank by a Division of Tommies. Artillery action commenced in earnest at 6 p.m. and every gun on the front – I should be afraid to say how many – began its twelve-hour bombardment of the German line. The roads were jammed with traffic, fifteen huge ‘land dreadnoughts’ puffing at their maximum speed, seven miles per hour, motors, lorries, guns, limbers, every species of vehicle. These caterpillar armoured machines are wonderful contrivances. They resemble a huge submarine fitted with caterpillars, and are armed with six pounders, and Lewis machine guns. They are bullet and shrapnel proof and can climb a trench or bank, and make their way over the ground coovered with shell holes. Big things are expected of them. You can imagine the terror of the Huns when these 39-ton monsters crawled right over their trenches”. GRAY was writing about tanks which were making their first appearance on the battlefields of France. But the secret weapon was not enough on this occasion to prevent the slaughter of thousands of Allied troops and the wounding of many thousands more. For Bill JOYCE the war was over because on the 15 September he became one of the victims of the ferocious shelling as the New Zealanders attempted to cross No-mans Land. His legs and in particular his right thigh were peppered with gunshot and shrapnel some of which he carried till the day he died almost 58 years later. The entry in his diary dated 14 September was to be his last. “Wounded were coming down in hundreds – ‘walking’ cases. These are wounded of every kind who can struggle back from the trenches. At ordinary times these cases go as ‘sitting’ in the cars, but in a big engagement there is no accomodation and they must hobble. We spoke to several, and found that High Wood had again held back the advance, and that the New Zealand forces would have to retire from Flers as a consequence. Our A.D.S. [Advanced Dressing Station] was at full pressure. 100 or more stretcher cases were on the road, all the available vehicles were at work, and wounded were coming in at the rate of one every three minutes. The Captain in charge gave me a corner of a dugout, and for twenty-four hours two orderlies and myself dressed without a stop, putting through sixty-nine cases on our ‘table’…”. “I got orders at 11 am to take forty-four bearers over to collect wounded, and report on number of casualties. It is a three mile journey over ground which had been won in the last three days, and for the most part is over a big ridge behind our new gun positions are placed. Encountered heavy barrage fire just before topping the ridge, high explosive and shrapnel bursting 200 yards ahead of us. It was a responsibility which I never want again. My orders were to go right through, and yet it seemed certain death to put men through it. We scattered, and made a dash down the other side, covering three-quarters of a mile to the post in record time. Major MARTIN told me he had been watching us through his glasses, and said that he couldn’t order the men back unless they were willing to go. The boys said Yes to a man, and I sent them back a squad at a time, waiting for the last. It was a nerve-racking experience, watching them climb back, slowly this time, their burden claiming all their attention. It was a remarkable thing, but not one shell out of the hundreds which burst on the ridge during those three or four hours, hit the thin trail which the bearers took on their way back. It must have been that Fritz was again merciful. Water carriers and ration bearers were killed on both sides, but only two New Zealand Medical Corps men were killed. I can assure you I kept to that trail on the way back, and told every man I met that we had been observing for several hours, and that this seemed the only safe course over hundreds of acres of ground. I had the cold fear of death on me for the half hour it took to get over the top, shells landing before and behind, and on both sides, and by the time we reached the Regimental Aid Post I was done. Infantry, with a bayonet, and with spirits running high for a charge face barrage fire constantly I know, but it is a vastly different thing with a sling around your neck, supporting a dead weight, and crawling at a snail’s pace over shell torn ground. The most common and effective method of escape – falling flat on your face, or tumbling into a shell hole, is denied the stretcher bearer. His first consideration is the man he has to get in, and nothing but a direct hit will make him drop his burden. I had only one case of cowardice, and he was a boy who should never have been sent out. As we were going over, he dropped out from his squad on some excuse, and hid in a shell hole until we disappeared, when he made his way back. I saw him later and he told me he was ill, and nothing could have dragged him over the ridge”. Bill’s wounds were probably bad enough that he needed the assistance of stretcher bearers. After initial first aid at the Advanced Dressing Station he was evacuated from the front by ambulance train on 16 September, and the following day was admitted to 26 General Hospital at Etaples. Some time between then and 18/12/1920 he returned to Australia and settled in Melbourne meeting and marrying Alice May DUNN. Bill JOYCE carried the shrapnel in his leg as a legacy of his war service until the day he died but it had little affect on his mobility. BEAN, C.E.W., The Official History of Australia in the War 1914-1918, Volume III, The A.I.F. in France, 1916. First published 1929, University of Queensland Press edition, 1982. New Zealand Secretary of Defence, Defence Headquarters, Wellington New Zealand, reply to Laurie JOYCE, 15 April, 1988.